As a born New Yorker, when I hear that a snow storm is coming, I think of the essentials I need to purchase: wine and snacks. No, I don’t need a flashlight or three blankets kept in my car. In New York City, everything is around the corner. You can look up any restaurant you want, any necessity you think you might need, or any event within a one subway stop radius and you can get it. With the exception of Hurricane Sandy, everything is open 24/7, and if it’s not, you can find somewhere that will be. One of my favorite past times was going to the 34th Street KMart, and yelling to my roommate across the other aisle that we needed to buy “ALL OF THE FLASHLIGHTS” the day before a snow storm was going to hit. Yes, sometimes I can be a kid at heart. People would start to hear us and worry, and they would purchase all of the flash lights. You’re welcome Kmart. So when a snow storm comparable to NYC hits Charlotte, NC, I think of getting my routine essentials plus a few dry foods, as Charlotte isn’t as equipped to handle anything more than a dusting. I think of my checklist: Diet Coke, Half & Half, Wine, maybe some sour patch kids, etc. A single gal has priorities. So, you can imagine my surprise at what I saw in the milk aisle. When a storm hits, are we instantly transported back to 1800s France? 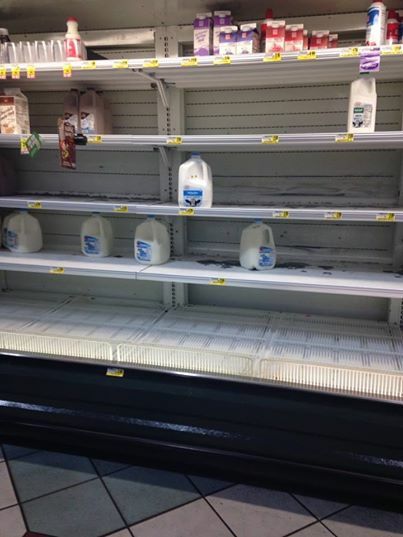 Why do people think that purchasing all of the Milk & Bread is a good idea? Who started this trend? As my friend Kate asked upon me showing her this picture, “Are they going to make French Toast”? Valid question Kate. If they are, I want to know where my invitation was for this French Toast Fest, because obviously it’s going to be a heck of a party. So guys, here’s a little advice in the AM from a New Yorker. You need food that can last. Milk goes bad in 2 days, and then you’re stuck with it smelling up your apartment, because the garbage man hasn’t been able to reach you since it’s a Snowpocalypse. Purchase wine…it’s already fermented! Snow storms/hurricanes/any other weather reason why we have work off are meant for you to enjoy the less finer things in life: Processed foods. So put on those comfy legwarmers, ask the hot neighbor in apt 2-D if he likes movies, and enjoy all of the snacks that will probably outlive you due to their artificial flavors and processing.